Bathers on the Steps of the Plunge. 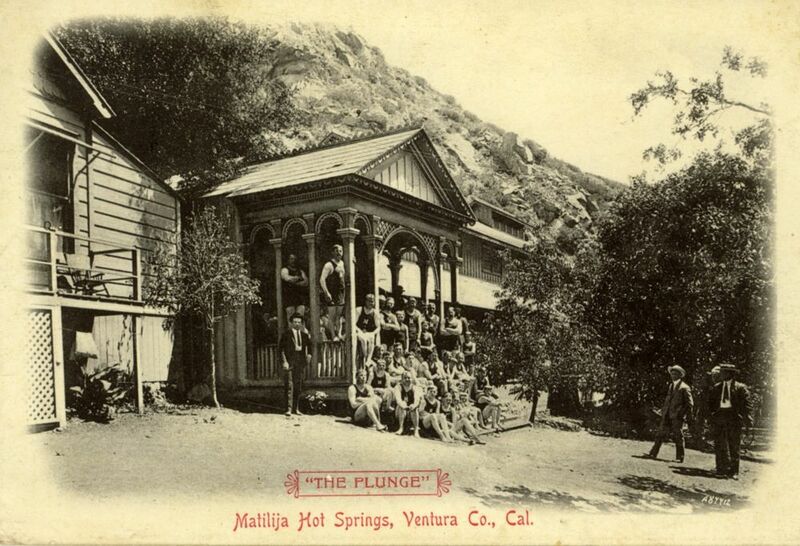 The Ojai newspaper reported in March 1902 that “Work on the building to surmount the plunges at Matilija Hot Springs has been begun, and the frameworks will be up in a couple of weeks with propitious weather.” The indoor pool was 150 feet long and 65 feet wide. Individual dressing rooms accommodated 70 people. Electric lights illuminated the grounds, and there was a covered dance pavilion. Matilija Hot Springs swimming pool in the 1950s. Later Open Pool at Matilija Hot Springs. Buildings and facilities at each of the Matilija Canyon camps were replaced over time, often due to the fact that one or the other had been destroyed by flood waters. Here we see a replacement to the earlier plunge at Matilija Hot Springs. 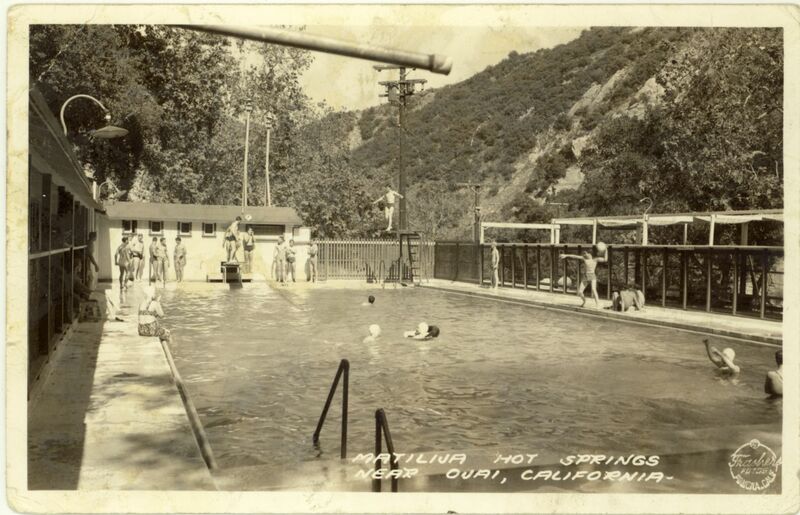 The scarcity of swimming pools elsewhere in the county resulted in lots of summer traffic to the pools in Matilija Canyon. The picture of the pool during the 1950s is just the way I remember it. Perfect. I can still smell the oak trees and hear the woodpeckers and I remember how cold the water was in the mornings. The bottom photo in the above article is how I remember the main pool looking in the 1950’s and early ’60’s when I was a young boy. What is not in the photo is the shallow “kiddie pool” that was located next to the main pool. It was located to the bottom of the above photo. I remember taking swimming lessons during summer vacations through the American Red Cross in these pools. School buses transported us kids from Ojai Elementary School to Matilija Hot Springs. The first diving-board I ever used was the spring-board seen in this photo. I remember jumping from the high-dive platform that’s in the photo, but could never muster the courage to dive from it. Our family took many enjoyable trips to the pool and used the accompanying picnic grounds where us kids would scramble down to explore and play in the adjacent Matilija Creek. I believe the facility was owned and operated by the Ventura County Parks Department during these years. Great childhood memories!!! Drew, hi. What great pictures. I’m sure we made many of those trips together. Also remember the store across the street where you could get frozen Milky Ways on a stick. Also remember crawdad hunting in the Matilija Creek right across from the pool. Many good memories there. It just did not get any better than this. When I would go to the store I would play my favorite song “me and you and a dog named Boo”. I love swimming there during. The 60’s and 70’s. Mr. Olivas ran the facility during the time I was there, he was also a cousin of the family vCalencia. I believed he did some pro wrestling at one time and his ring name was Elephant boy. What a trip. I remeber sooo many birthdays there. Swimming, catching pollywogs that we couldn’t figure out what to do with! The store with the pinball machines, we lived in Ventura but we were always ready tomake that drive. When I was older we’d go up to the overflow and swim there, wish the place was still open to the public. I remember the trips there with all the kids in the neighborhood in one car. I also took swimming lessons there. I also remember exploring Matilija Creek . Catching polywogs and crayfish. When I was in my teens I would go up there and catch crayfish and Mr. Olivas would boil them up for us. After the meal we would always get frozen Milky way bars on a stick.Always hungry after a day of swimming & exploring Ah, the hot summer days of childhood. I use to go there as a child. Loved it! I have so many great memories there! The family and I took a drive to Ojai today, and I couldn’t find it. I read above that it is closed to the public. Disappointed to hear that! Where can I find the directions to get there so that I can drive my family by there? Hi, Lupita. Matilija Hot Springs has been closed for several years now. It’s behind locked gates so you can’t even see it, although there is an historical marker visible. To get there, drive up Highway 33; just before the road heads up into the narrow canyon, there is a bridge that turns off to your left. That is the road to take. All the little hot springs resorts up the canyon are closed now, victims of flooding, lifestyle changes, and environmental concerns. Read Mark Lewis’ article on Wheelers for more on the history of this area. I was doing a search for the old Matilija Plunge and picnic area. Our grandparents took us there every summer when we came to visit them in Ojai. This would have been 1956 – 1966. What great pictures! Sad to hear that it is now closed. Hoping to see a revival of this beautiful spot! This land holds so many good memories for us!! Most of us live in Colorado now. Next post: Ojai’s Gold Rush!